PM Modi's first meeting of attack on terrorist camps, then repeated song- I will not bow down to the country. Prime Minister Narendra Modi said in a rally in Churu of Rajasthan - "I will not bow down to the country." It is the lines of the same song that BJP made the party's champion in the 2014 Lok Sabha election. PM Narendra Modi's rally in Churu, Rajasthan. Prime Minister Narendra Modi has said once again - oath me this soil, I will not destroy the country. The opportunity was in Churu of Rajasthan rally. This was the first meeting of Prime Minister Modi after the extraordinary action taken over terror camps after crossing the Line of Control. 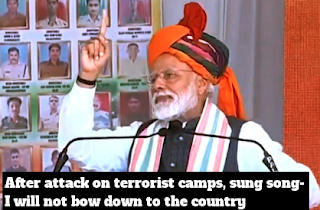 Prime Minister Narendra Modi sang the same song on stage, during which BJP made a theme song of election campaign during the 2014 Lok Sabha elections. This song created a different atmosphere in the 2014 Lok Sabha elections. After the Air Force's action against the terrorists in POK, PM Modi in Churu of Rajasthan said that in 2014 I said that the country will not bow, but again I am saying that I will not bow the country. PM Modi again addressed the rally and recited the poem again. He said - Today your temperament looks something else. First of all, stop the two fists with me and speak with full force- 'Bharat Mata Ki Jai' PM Modi said that I understand your enthusiasm. Today is a moment in which we all come and bow down to bowing down to the mighty heroes of India. Today, Chuuko's earth assures the countrymen that the country is in safe hands. I will not bow down to the country In the 2014 Lok Sabha election, this BJP campaign's election campaign was specifically prepared for broadening the PM Modi. This song is written by famous lyricist Prasoon Joshi. The opening lines of the song are in the voice of Narendra Modi, and the rest of the lines have been given by the noted singer, Sukhwind, while the voice is given, the music is given by the order Srivastava. On March 25, 2014, Narendra Modi tweeted about this campaign anthropologist of BJP. I will not bow down to the country.